Does MOTU's slick interface live up to the hype? Great sound, flexibility on tap and the software/hardware relationship works well. Lots of I/O, including comprehensive digital spec. AudioDesk (for Mac) and CueMix software bundled for recording and control. Relationship between soft and hardware functions nicely designed. A little pricey. Massive breakout cable. Odd power attachment. MOTU's range of interfaces has expanded and become more refined over the years but it remains a major player in a now packed marketplace. 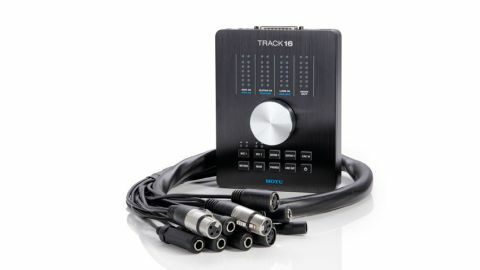 The Track 16 is the latest in its line of pro interfaces and it offers some tasty-looking credentials: lots of I/O, high quality audio capture and an interface which appears to provide a new level of tactility. Does it live up to its own hype, though? Once you've installed the bundled software, which loads a driver and the latest version of MOTU's own impressive CueMix software, you're free to set up the hardware. This consists of a chunky but relatively compact near-square black interface, to which you'll need to attach the bundled break-out cable which offers a raft of I/O options. "MOTU's audio interface pedigree shines through the preamps, and the sheer ease of use here is impressive too"
You have the choice to connect via USB or FireWire 400. If you choose the latter be aware that, as a future-proofing measure, MOTU have provided this speed of data transfer via a FireWire 800-shaped port. The interface itself offers some I/O, with a first guitar input, a mini jack line input (labelled 3-4) plus 1/4-inch and mini jack headphone outputs. Additionally, you'll find digital I/O options providing eight channels of ADAT optical at 48kHz, four channels of S/MUX optical at 96kHz or stereo TOSLINK at up to 96kHz. The break-out cable expands these options significantly, with twin XLR microphone inputs, MIDI I/O, a second guitar input, 1/4-inch line ins (labelled 1-2), main outputs, a second pair of line outs and, somewhat curiously, the 14V power connector too. This hybrid FW/USB connectivity provides an interface capable of recording signals at up to 192kHz with 24-bit resolution and, as you'd hope and expect, all inputs can be used simultaneously. The mic pres are of a very high standard and feature independently-enabled 48k phantom power switches. MOTU has realised that once you've connected your chosen inputs, you won't want to spend your life toggling between their software and your chosen DAW, so many functions can be carried out from the upper surface. These include a rotary which can be used to trim inputs, boost output levels and control levels for all other I/O via a grid of nicely illuminated rubber buttons below the central wheel. However, if fine details are required, CueMix provides a comprehensive panel of options. The Track 16 is, without question, a high-quality interface with plenty of 'pro' features. We're not huge fans of its chunky 'snake' break-out cable design, though, especially as it contains the power attachment. This means that if you're working via USB, even if you're 'only' editing and don't need the input connectors, you're still duty-bound to connect the snake, though it is worth pointing out that FireWire connectivity provides bus power. This issue aside, MOTU's audio interface pedigree shines through the preamps, and the sheer ease of use here is impressive too.